Keri D. Sherman joined the litigation department of the firm in April, 2011. Ms. Sherman specializes in civil litigation, in the areas of insurance law, debt collection, family law, and personal injury. Ms. Sherman also has experience in liquidations, wills and estates and trusts, and real estate and conveyancing. Ms. Sherman obtained her BA in Law and Business Administration from the University of Kent at Canterbury in the United Kingdom in 2006 and completed the Bar Vocational Course at the Inns of Court School of Law (ICSL) in London England in 2007. Keri was admitted to the Bar of England and Wales in July, 2007 and to the Bar of the Commonwealth of The Bahamas in October, 2007. Ms. Sherman obtained her Diploma in International Trust Management from the Society of Trust and Estate Practitioners in 2013 and attained the designation of Trust and Estate Practitioner in March of 2014. 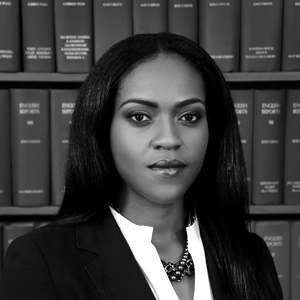 Ms. Sherman is a member of The Bar of England & Wales, The Honourable Society of Gray’s Inn, The Bahamas Bar Association and the Society of Trust & Estate Practitioners (STEP).